• 2 Twin beds in the third bedroom - perfect for the kids! • Access to Award-Winning Tennis Facilities and Programs! • 24-hour hotel-style front desk & local concierge service, makes check-in and late arrivals a breeze! Escape to our lovely and modern 2,775 sq.ft. holiday home, surrounded by 120 acres of lush forests within the Green Mountains. We think you'll love to be tucked away from the hustle and bustle, while still being only a 10-minute drive from the delicious restaurants and trendy shops in downtown Stowe. We highly recommend sitting out on your private deck to take in views of Mt. Mansfield with a glass of your favourite wine. There are 3 BEDROOMS in our home - the master bedroom features a luxury King bed, the second bedroom contains a Queen bed, and the third contains 2 Twin beds. Bedding is supplied for you free of charge. Get ready for the day ahead in the 3 BATHROOMS. Enjoy the Jacuzzi tub in one of the bathrooms, and we have you covered with FREE toiletries and towels! The open-concept LIVING AREA is warm and inviting. Kick back on the comfy sofa in front of the toasty gas fireplace, and catch a movie on the satellite TV. Just outside, you will love the wood sitting deck! The full KITCHEN provides everything you need to cook in the comforts of your mountain getaway. Enjoy your meals together or play board games around the lovely dining table with seating. A convenient in-suite washer and dryer will have you feeling right at home. Our guests enjoy access to a number of excellent amenities at Topnotch Resort and Spa, where this home is conveniently located! Make sure to take advantage of the world-class Tennis programs and courts available to you at Topnotch Tennis. Swim laps in the indoor pool or dive into the seasonal outdoor pool in the summer. Pamper yourself at the excellent spa on-site, offering a variety of massages and facial treatments as well as a sauna. You will love to indulge at one of the TWO restaurants available to you - Flannel offers fantastic farm-to-fork dining! We highly recommend bringing a car to explore this beautiful region, and there is complimentary Valet and Self-Service Parking on-site. If you're interested in bringing along your furry companion, please enquire with our team and we will be happy to try and accommodate you and your pet for a fee. Please note that a daily resort fee per bedroom per night, a security deposit, and a cleaning fee will be collected upon your arrival. The resort fee includes wireless internet access throughout the property, year-round valet and self-parking, shuttle service to the Mountain Village and Stowe Village, afternoon tea and cookies, daily newspaper delivery, baggage storage, access to the cardio and weight studios, sauna, steam room, indoor pool, outdoor pool and hot tubs. 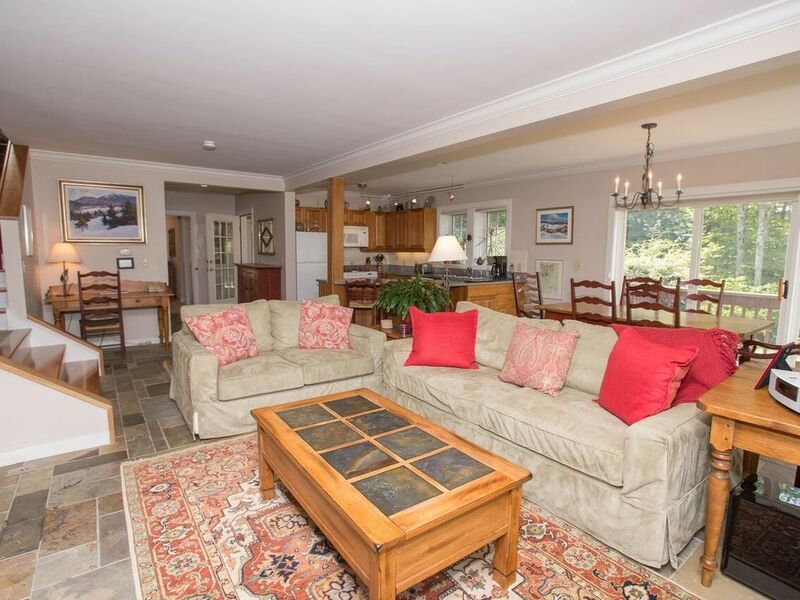 In the winter, you will love to be minutes from the slopes of Stowe ski area or the cross-country ski trails. During your visit, take a stroll along the Stowe Recreation Path, a 5.3-mile paved path that runs from Topnotch to the Village and winds along the West Branch River - enjoy stunning mountain views and access to swimming holes, restaurants and shops! We think you'll love to take the gondola up to Mount Mansfield to appreciate exceptional views, or visit Bingham Falls for a refreshing break. We highly recommend doing the 4 Points Brewery Tour to visit the best local breweries in Stowe. In the morning, head to the local coffee shop 3 minutes' drive away, PK Coffee, for delicious coffee and a great community atmosphere!